Trump and the GOP have massively unpopular tax policies. Even wealthy Republican voters support higher taxes for themselves. 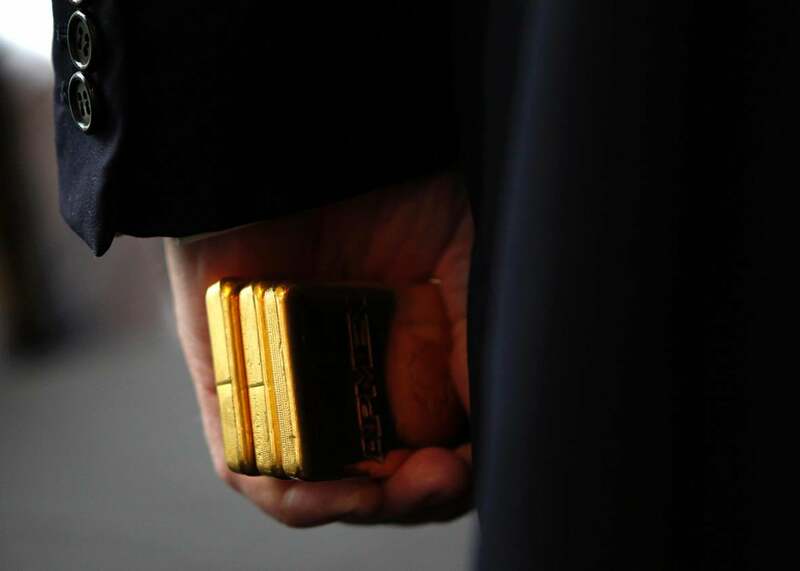 Developer Donald Trump holds three bars of gold bullion during a 2011 news conference. There is no more unifying issue for the Republican elites than support for massive tax cuts for the rich. Three weeks after the election of Donald Trump, it might be their only defining issue. Among voters, however, support for this policy is incredibly unpopular. Not only do a clear majority of voters oppose the idea of cutting taxes for the rich, this opposition also bridges partisan divides, geographic divides, and even income levels. President-elect Trump’s positions, to the extent that he has actual positions and not just passing moods, are often at odds with Republican orthodoxy. They disagree on Russia, NATO, nuclear proliferation, and the Iraq war (sort of). Trump casually concedes gay marriage, the centerpiece, along with the Iraq war, of George W. Bush’s 2004 re-election strategy and a rallying cry for Republicans. He inveighs against free trade, at least when politically convenient, and he demagogues on immigration where the Republican elite had once been at pains to soften the party’s attitudes. And while Trump claims to support the repeal of the Affordable Care Act, he has been on the record voicing support for a social safety net and infrastructure investment. Taxes, though, are another matter. On tax policy, Trump looks a lot like his archnemesis, House Speaker Paul Ryan. In fact, his plan is a slightly more regressive version of Ryan’s. Since January 2016, we have tracked the policy preferences of Americans on a variety of questions, including how voters feel about increasing income taxes for people making over $250,000 per year. This question approaches the issue of taxes from a liberal angle, i.e. we asked about raising taxes. Republican elites don’t just oppose raising taxes on the rich; they would like to drastically reduce them. If the majority of the populace wants to increase taxes for the rich, you’d expect an even larger share to disapprove of a Republican platform that advocates cutting taxes for the rich. What we find is about as crystal clear as data possibly can be: The Republican position is massively unpopular, not just with American voters, but with Republican voters, rich voters, and even rich Republican voters. Our dataset is unique in several ways. First, while little polling is done on public opinion (versus the horse race stuff), our polling not only covers a variety of key public opinion questions but does so with massive set of 50,000 respondents spread out evenly across the entire year. This provides us both scale and time granularity. Second, we collect the data via smartphone with Pollfish. While this is a new and exciting way to collect data (and possibly the only useful mode going forward, as landlines become obsolete), it also means that we are not capturing the opinions of a representative sample of Americans. But with the advent of Big Data and advances in machine learning and statistics, we can process the raw data and get representative estimates not only for Americans overall, but for more fine-grained demographic categories. We can break down by state, or by income bracket, or by particular partisan identity and by income bracket. Looking at our national-level tracking of support for tax increases for the wealthy, one thing is obvious. Support for tax increases on income over $250,000 is enormous and grew throughout the campaign. In our most recent wave of polling, in October, more than 77 percent of the population was in favor of tax increases for high earners, up significantly from the 71 percent in favor when we first ran our survey back in January. What’s more, the moderate position is hollow: A mere 10 percent of American voters indicate that they do not care either way in our latest wave, shedding doubt on whether Americans intuitively converge to the center in their policy preferences, as suggested by some political scientists. One of the neat things about both the scope of our data and our statistical method is that we can analyze spatial variation in the sentiment toward tax increases for the rich. If we take the data from all our respondents, and we employ the statistical analytics described above, we can plot out a state-by-state map by policy support. We categorize every state in which the tax-the-rich position is advocated by more than 66 percent of the population as “strongly supportive,” and every state in which the same position is advocated by more than 50 percent but less than 66 percent of the population as “moderately supportive.” Most states come in as very supportive, apart from Republican bastions Arkansas, Louisiana, Mississippi, Montana, Texas, and Utah, which come in as moderately supportive. In no state does the majority of the population actually oppose tax increases for the rich. If we look at Republicans only, we register a steep increase over the course of the campaign in support for tax increases across income brackets (highest being $100,000 or more, which is the top 12 percent or so). The Trump campaign, it seems, has made Republicans more welcoming of tax increases for the rich. And more importantly, Republicans with an annual income north of $100,000 are in favor of raising their own taxes, and it is not even close: In October, by our estimate, nearly 70 percent of that demographic favored tax increases. Among Republicans overall, 71 percent are now in favor of increasing taxes for the wealthy; in January, that number was 61 percent. As the election unfolded, Republican voters grew even more alienated from the position of their party’s elite.